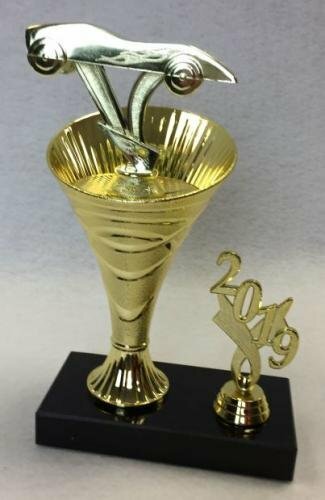 Our Rising Swirl cup column riser trophies are an elegant and attractive option to recognize your pinewood derby champions, select one of our designs or submit a custom design request to recognize your Pack. Custom sizing, column and alternate figures are available upon request. Have a design in mind? Let us know and we can assemble it for you! 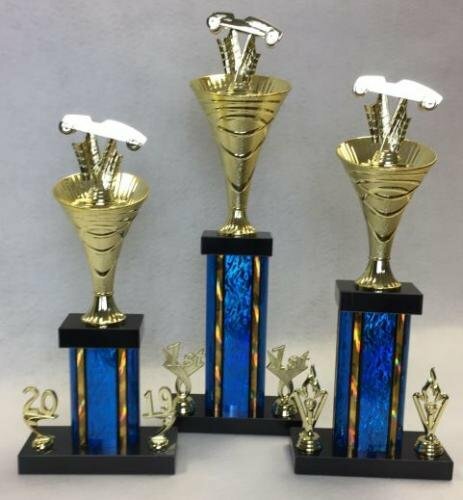 Set of 3 Pinewood Derby Trophies - 13", 14.5" and 16" Trophy with Rising Swirl Cup Riser, Rectangle Column and Pinewood Derby Car Figure on a Black Marble Base with Side Trims and Engraved Plate. Save $.75 per Trophy by ordering in a set. Select a Figure and Trim Package for each set. 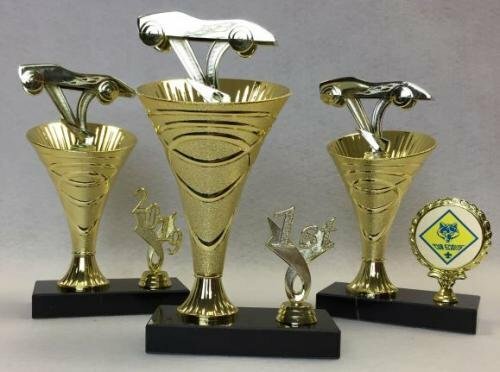 Set of three Rising Swirl Cup Pinewood Derby Trophies - 13", 14.5" and 16"
Pinewood Derby Trophy - Rising Swirl Cup Trophy with Cup Riser, Trim Set, Rectangle Column and Pinewood Derby Car Figure on a Black Marble Base with Engraved Plate. 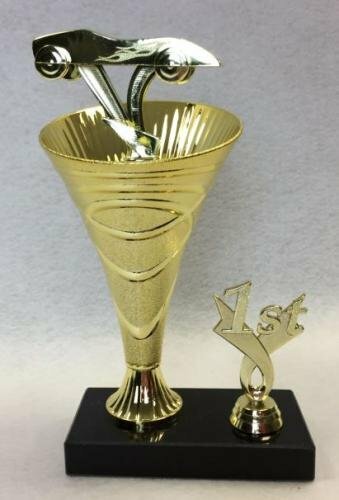 Pinewood Derby Trophy - Rising Swirl Cup Trophy with Cup Rise, Side Trim and Pinewood Derby Car Figure on a Black Marble Base with Engraved Plate. Set of 3 Pinewood Derby Trophies - 10" and two 9" Trophy with Rising Swirl Cup Rise and Pinewood Derby Car Figure on a Black Marble Base and Engraved Plate. Save $.50 per Trophy by ordering in a set. Does not include option for Mylar Holder pictured in set, side trims only. 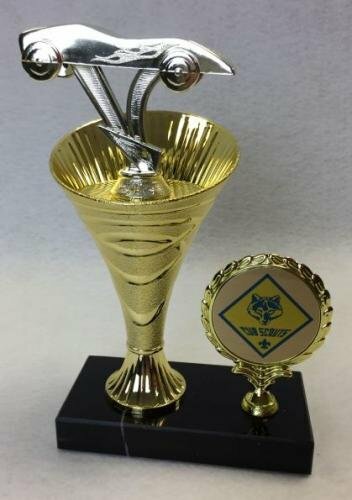 Pinewood Derby Trophy - Rising Swirl Cup Trophy with Cup Riser, Logo Mylar Holder and Pinewood Derby Car Figure on a Black Marble Base with Engraved Plate.